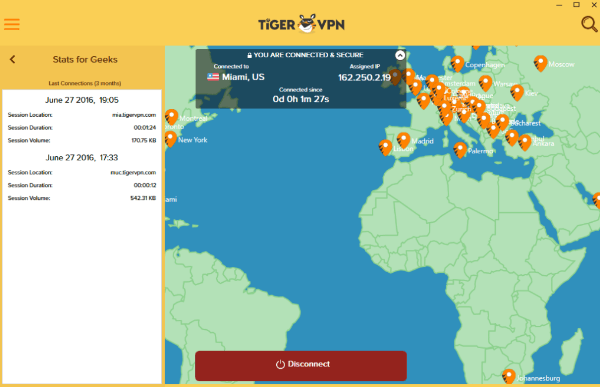 TigerVPN Review: Should You Get It? TigerVPN is an up and coming VPN service that is slowly making a name for itself. TigerVPN came onto the scene in 2011 so in that sense it isn’t a veteran of the VPN industry and neither is a, what you would call, a newbie. With that said, it is also true that the company’s main targeted audience is the average VPN user who just requires a simple but effective VPN service and a secured access point to the internet. And to be honest, TigerVPN, to some extent, does provide its users with a quick interface that is easy to use and intuitive to configure. As indicated before, TigerVPN, relatively speaking, works on a small scale. You won’t get getting discounts on orders over 100 with TigerVPN. The company simply hasn’t acquired the required growth yet for that kind of operation at a massive scale. But even with its small size, TigerVPN does offer a broad range of servers and a refined user interface which makes it quite an easy application for any novice user to get accustomed to . But how does TigerVPN hold up against some of the bigwigs in the VPN industry? To put it another way, can TigerVPN rub shoulders with the giants of the VPN industry such as IPVanish? To its credit, TigerVPN doesn’t want your money. At least not right away. 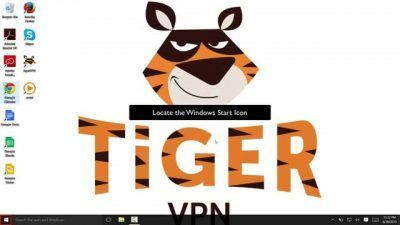 The VPN service company actually offers users a free trial which allows users plenty of time to test out TigerVPN. The trial version of TigerVPN comes with a data cap of 500MB and a restricted number of servers in terms of selection and actual physical numbers. A 500MB data cap might sound like not enough but for a free trial, our experience tells us that it is probably a pretty good deal. Of course it the user decides that TigerVPN is worth their money then the company offers quite a number of advanced packages. A user has the option to choose from Zen Tiger, Strong Tiger, and Hero Tiger subscription plans. And once you sign up to one of these, you don’t need to worry about bandwidth limits because each of these advanced packages come with unlimited bandwidth and a non-existent data cap. Let’s talk about Zen Tiger subscription plan for a moment. The Zen Tiger from TigerVPN actually offers two simultaneous connections. It will cost you around $9.99 per month and you’ll have to pay the dues on a monthly basis. The other thing you should take note of that even though prices are listed for each package, they are not converted to other currencies such as Euros and the British Pounds. In other words, a Zen Tiger plan will cost you with $9.99, or GBP 9.99 or 9.99 Euros per month. No prizes for guessing that the deal is most economical when you subscribe to it by purchasing it in US dollars. That’s what a difference your location can make. Of course, not everyone will have that option, so let’s move on. The Strong Tiger plan from TigerVPN is actually a six-month subscription plan. Users who subscribe to this package will have to pay the whole amount upfront at $8.33 per month. Along with that, if offers three, which is one more than the Zen Tiger plan, simultaneous connections. Users are allowed to pay either through credit card, Bitcoin or PayPal. Now we come to the last package and that is the Hero Tiger subscription plan. This plan gives you a massive five simultaneous connections and will cost you around $6.67 per month. It only comes in a one-year subscription package. The Hero Tiger package easily outranks all other TigerVPN packages because of its value for money. Of course, you don’t pay anything for the free trial but as far as paid packages are concerned, the Hero Tiger plan is the most economical. But the Hero Tiger plan doesn’t just offer you the cheapest package in terms of monthly payments. The package comes with a set of bonuses and extra features. Extra features like a free subscription to Sticky Password (which is a decent password manager) and a Shimo VPN manager (a special VPN client that is specifically made for Mac). Of course, one has to ask the question as to why TigerVPN offers another VON manager when the company has its own. It appears to be a redundant extra feature, to be honest. But it certainly can help if you intend to manage several VPN networks at once. With that said, the password manager in the extra features section doesn’t count for much. There are literally tons of free and excellent password managers in the market at the moment so Sticky Password is nothing to drool over. But the increased number of simultaneous connections and a decent drop in the monthly price does make Hero Tiger deserving of your money if you have prepared yourself for a full year of VPN service subscription. 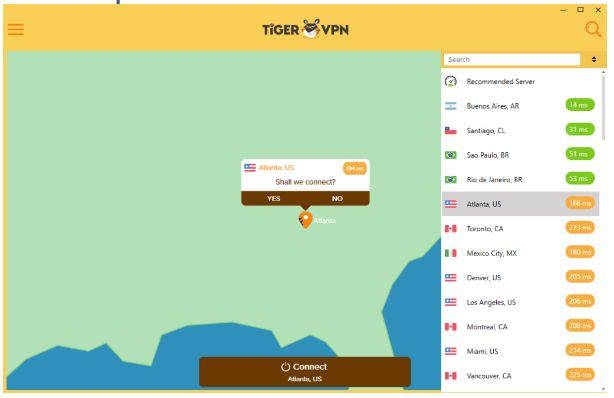 TigerVPN offers users four settings. One is the OpenVPN over UDP, which is the default option for connection protocol. The other options are OpenVPN over TCP, L2TP/IPSec and PPTP which are all present to provide backup in case the default connection protocol doesn’t work for some reason. Some industry experts are of the opinion that OpenVPN is the most secure and open-source connection protocol available, so we’ll go with that. If you want to go for torrenting then TigerVPN allows you to do that though the company doesn’t support neither endorses torrenting. As just mentioned, you can do all the torrenting you want on all of the company’s servers. TigerVPN also comes with a DNS leak protection service which blocks any webpage’s request to go through your own ISP’s servers. Pretty neat right? Moreover, random DNS requests, which are pretty common in the online world, are actually managed by TigerVPN’s own DNS servers. If you visit TigerVPN’s official website, you won’t be able to find a kill switch feature. But some reviewers have been told by the company’s customer support that TigerVPN can block online traffic if the company detects a connection drop. TigerVPN also has a Karma program. Through this program, users can earn bonus simultaneous connections. Essentially, the Karma program is a point-based system and customers who participate in it are rewarded for promoting the company’s VPN service on social media. No, you don’t become the company’s social media manager. All that the program requires of the user is to like and follow TigerVPN on relevant social media networks such as Facebook and Twitter in this case. And if you use TigerVPN and found it to be a reasonably good service then the company rewards you with further points if you write a positive review on pre-selected websites. Will I Be Able To Watch Netflix With TigerVPN? TigerVPN can successfully connect to a US server and enable users to watch the American version of Netflix. Why would you want the US version of Netflix? Well, because it has the largest and most popular set of TV shows and movies. But there are a lot of other VPN services out there that do provide this functionality so TigerVPN isn’t unique in this aspect. What About TigerVPN Setup and User Interface? Setup is pretty standard here. All you need to do is download the software package from the official website and install the operating system client on your computer. You’ll need a username and password to do that. But once you have the software up and running, you will be able to select “pins” from a world map to select your server’s location. Else, you can just click the connect button to start the service. The connect button will automatically connect you to the most stable server. Stable servers can be determined by latency values. You can zoom in the map if you didn’t do well in your geography class and can then select a server from a searchable list of servers. You can change the order of the list by latency, city, and country. If you’re on a mobile device then tapping on the menu icon in the top-left corner of the screen will bring up a menu for customer support. The menu will open a page in your default browser and will show you some basic connection statistics. You can adjust settings from this menu. 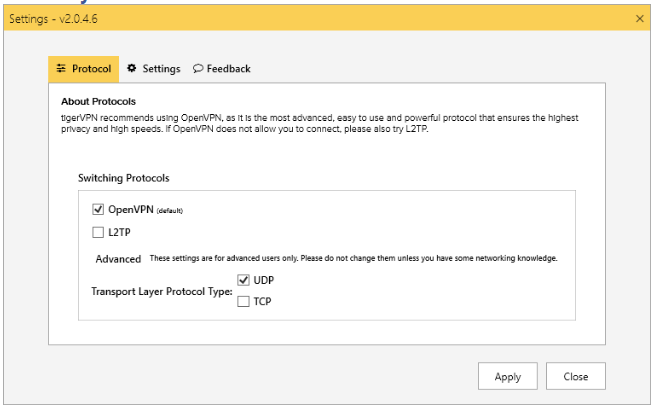 The setting menu also allows users to select between OpenVPN or L2TP connection protocols. You can also choose between UDP and TCP ports. Apart from that, there are also some startup options and feedback form. 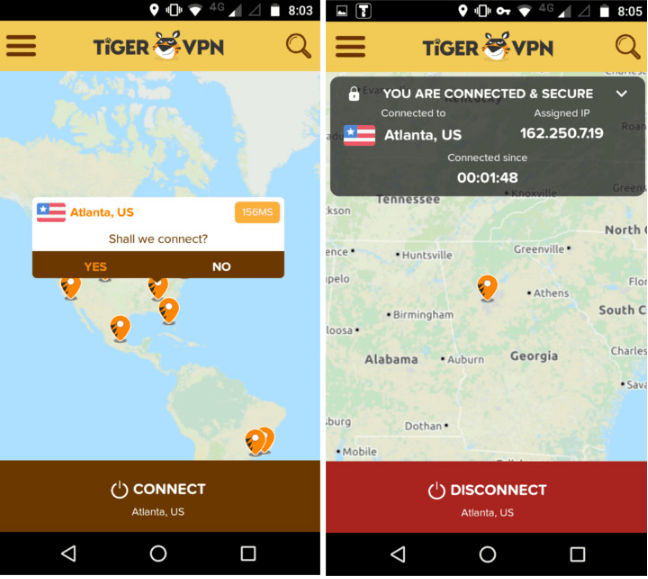 Users will be hard pressed to notice a difference between the mobile and desktop version of TigerVPN. Of course, both versions of the app will have different dimensions on the screen. The only addition to the mobile app is live chat support. This feature is currently not available on the website or the desktop application. TigerVPN runs fairly smoothly and as mentioned before, is simple in its interface and intuitive in its use. 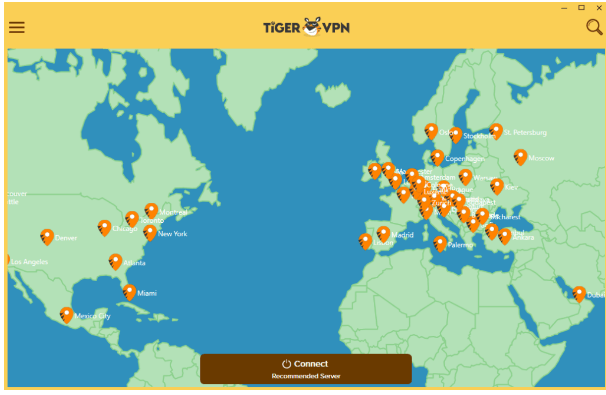 All of TigerVPN’s openVPN connections are 256-bit encrypted. What does that mean for the customer? It means that you’ll be protected from everyone on the planet except the most resolute and steadfast of government agencies and online hackers. In other words, your online activities are safe from being spied on with TigerVPN. Perhaps the most underappreciated part of TigerVPN is that the company doesn’t keep a record of log files. It doesn’t even keep usage data, traffic data or any other sort of activity that might compromise a particular user’s identity. With that said, the company does keep the IP addresses of its customers at the time of purchase so that the company has the opportunity to identify and avoid credit card frauds. Additionally, a customer’s session information along with time spent using the VPN service and amount of transferred data are also kept in record for legal purposes. Although, TigerVPN service maintains that the records are kept to provide better and a stable VPN service to the customers. The company also says that the data it collects helps it to provide more resources to the customers. If it’s of any help at all, the company is based in Bratislava, Slovakia which is considered to be a part of European Union. As a result, the VPN service is not directly under obligation to follow user data retention laws when it comes to VPN services. Apart from that, there is a NAT firewall that is cooked into the application. This firewall essentially blocks any inbound traffic that is unsolicited. This feature can be considered to be a plus for most users but it does have the, rather negative, side effect of slowing down some P2P applications and hence messing up their functionality. TigerVPN has over 300 servers in more than 62 locations across more than 40 countries. The company also has servers in seven United States cities and has two in Canada along with two in the United Kingdom and one in the Netherlands. As mentioned before, TigerVPN is a relatively small operation company and does not own whole data centers. But the company does have ownership of its individual servers on the racks. As far as performance goes, TigerVPN easily played 1080p HD video without stutter and loaded well past the buffer point. It can safely play online games such as Super Smash Bros-style and other similar games. Though sometimes customers have reported a bit of lag which causes an annoyance. When an 82.7MB file was downloaded from three different servers at three different times, every day, for nine tests, the results were reasonably sufficient. But speeds did vary a lot at different times. When compared with a VPN such as Buffered VPN and a control group without a VPN, TigerVPN’s performance was exceptional. Though some tests couldn’t keep up download speed over 100KBps, it was still competitive against other VPN services. We also know that TigerVPN’s speed is inhibited by peak network traffic time and the location of the company’s servers. Of course, downloading a file does not absolutely indicate the speed of any VPN service because the internet, inherently, is an erratic place and that adds a meaningful factor of unpredictability. In other words, VPN speed tests should always be considered with a grain of salt. Is The Customer Support Any Good? As mentioned before, the mobile users of TigerVPN application have the utility of live chat support which is not available on desktop or website version of the VPN service. TigerVPN’s customer support works through a ticket submission system and that is the primary way of communication between the customer support and the customer. Some reviewers have reported that TigerVPN’s customer support while not the fastest is certainly one of the most knowledgeable about its own product. Though it has to be mentioned that the response time was much less when using the mobile version live chat option. As far as the FAQ and the general knowledge base is concerned, TigerVPNs is pretty solid. TigerVPN has a searchable knowledge base and the content on the website reads quite well. There weren’t any reports about customers receiving unsolicited emails or other spam messages. It depends. If you want a VPN service that is user-friendly and easy to set up and comes at a reasonable price, then TigerVPN can be a pretty sweet deal. TigerVPN has a variety of server locations and has tight security measures. The only downside is the randomness of its connection speeds and the fact that it stores some log files on its customers. Though we recommend going for either IPVanish or StrongDNS (StrongDNS comes free as a DNS service with StrongVPN), you can make up your own mind by reading about other top VPN services.